In their bid to easily take their victims hostage, suspected kidnappers have devised another means to have be successful. This was made known by the kidnappers while being paraded by the police in Owerri. 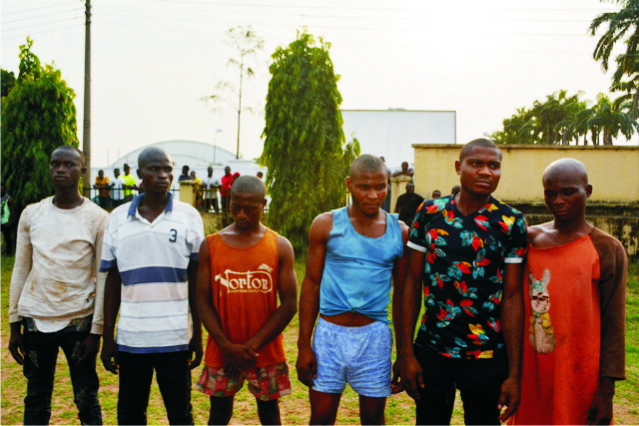 According to police, some of the suspects held in connection to a kidnap case have confessed of using uniform of NYSC members to operate. According to police suspects arrested in connection to the kidnap of a woman and passengers in Sienna vehicle confessed the use NYSC uniforms to flag down drivers and later attack them. Police in the briefing said “ an arrest of armed robbery kidnap, murder was made against Obinna Opara Basil male 32 years, Kalanwa Goodluck male 32 years, and Chimamkpa Eziria male 17 years between 21st and 24th of January 2019 at Omerelu Ikwerre LGA in Rivers State and Mgbeshi in Ohaji/Egbema LGA respectively for robbery Mrs Maria Chijoke and all occupants of Toyota Sienna with one locally made pistol and one English pistol and kidnapping unsuspecting road users along Port Harcourt, Owerri Road. Information has it that the suspects also confessed that they use NYSC uniforms to flag down drivers to attack them”. On 19/09/2018, the above named kidnap suspects abducted and kidnapped one Christian Duru ’m’ from Awo-Mamma in Oru East. As fate would have it the kidnap suspects arrived Orlu with the victim and in effort to kidnap a second victim one Ekwueme Uchenna, their car fell into a gutter and from the ensuing scenarios the first suspect Christian escaped. On 20/09/2018, operatives of SARS of the command in collaboration with PMF 18 personnel swung into action and rescued the second suspect a day after he was kidnapped. Suspects have made useful statements and confessed to the crime. On 13/12/2018, operatives of Special Anti – Robbery Squad SARS of the command arrested the above named suspect at old stadium road by Tetlow Owerri. The suspect who has made useful statements to the police and confessed to the crime stated that the victim was killed because of secret cult rivalry as according to him the victim belong to Baggas while he is of the Ayes confraternity. ARREST OF KIDNAPP SUSPECTS/RECOVERY OF VICTIM’S SUV CAR. Sequel to the arrest of kidnap suspects and rescue of victims of American returnees to Owerri on 21/12/2018, their SUV jeep taken away was recovered. The vehicle was recovered on 24/12/2018 at Umuezuke village Awo-Amma in Oru East LGA of Imo state. The robbed vehicle was secretly parked in a car park with well secured door lock in a story building waiting for ready buyers. Kalanwa Goodluck ‘m’ 32 years old. iii. Chimamkpa Eziria ‘m’ 17 years old. The above named suspects were arrested between 21st and 24th of January, 2019 at Umerelu Ikwerre LGA in Rivers state and Mgbeshi in Ohaji/Egbema LGA respectively. They have made useful statements to the police and confessed to have robbed and kidnapped unsuspecting road users along Port-Harcourt/Owerri road. They also confessed that they use NYSC uniforms to flag down drivers to a stop for assistance after which they kidnap occupants of such vehicles for ransom. On 08/01/2019, the above named suspect in company of three others now at large, took off from River State to Owerri where they attacked unsuspected quests at ‘JUKWESE RESTAURANT & BAR’ at no. 5 Emma Ugorji Street Owerri. Suspect was arrested and a locally made pistol, one expended and live cartridge recovered from him. Suspect confessed to the crime and investigation ongoing. On 17/01/2019, the above named suspects went into the Nigeria Immigration Service transit camp in their Command’s permanent site at Avu Junction and robbed them of three Plasma Television, cash of forty two thousand naira (#42,000), seventeen thousand naira (#17,000), four handsets, two wrist watches and other cloths. On 26/01/2019 the same gang robbed one Mr. Ikechukwu Ikenga ‘m’ of Umunebo Obinze of his properties – One Q-link Motorcycle, Drinks and cloths, Cash of sixty four thousand naira (#64,000) and Three Handsets. Again on 31/01/2019, the same gang also robbed One Mr. Augustine Ekeigwe ‘m’ of Oboku Obinze in Owerri West of his belongings – One Motorcycle and Three Handsets in his house on gun point. On 26/12/2018, Operatives of SARS of the Command led by the Commander arrested one Nwachukwu Uchenna who is involved in a case of Kidnap/armed robbery. The suspect confessed to the crime and mentioned his accomplice one Daniel Alozie aka ‘Murano’ now at large. Suspect also confessed that they collected the sum of five hundred thousand naira (#500,000) from the said victim after they have collected the sum of three million naira (#3, 000000.00) ransom from the victim’s family. On 21/11/2018, following information received that a victim was kidnapped at Obitti in Ohaji. In view of the information, police operatives swung into action and rescued the victims in a forest. Subsequently, two of the suspects were arrested at Ohaji and one of the victim’s Chief Stanley Anoruo identified the suspects who shot him and because he could not walk to follow them carried him on a wheel barrow to the forest where they were kept. Investigation is in progress. On 19/1/2019 at about 0630hrs, operatives of SARS led by ASP Banjoko arrested one Obialor ‘m’ aged 23 years old of Amaraku in Isiala Mbano LGA of Imo State, an armed robber who is responsible for incessant, terrorizing innocent road users at Oboh Community in Isiala Mbano LGA of Imo State. On interrogation, he led the operatives to the arrest of his gang members, the above mentioned suspects have confessed to the crime. in Isu LGA of Imo State where the Sienna bus was recovered, effort is on top gear to apprehend other fleeing suspects, investigation is ongoing. On 11/12/2018 at Orlu UBA round about in connection with the armed robbery attack on one Mrs. Kalu Sabina ‘f’ of Umuokwe Orlu, Chigemezu Ogbonna and his gang members robbed the victim of the cash sum of one million naira (#1,000.000) which she withdrew from First Bank Orlu, suspect confessed to the crime, investigation is ongoing. On 28/1/2019, Davison Nnorom was apprehended while trailing unidentified customer from first bank Orlu. He was identified as one of the armed robbers who were responsible for robbing the sum of N250,000 from one Ohakwe Gloria Chinwendu ‘f’ of Living World Academy School Nkwere LGA on 18/1/2019 Emelogu Complete ‘m’ of same address also identified him as one of the armed robber who attacked and robbed him of the sum of 3300,000.00 on gun point at Orlu. On 5/12/2018 operatives of SARS arrested one Amarachi Favour Ihejirika ‘f’ of Umugama Owu-Amakohia in Ikeduru LGA Imo in connection with the alleged crime. On her part, she confessed that the gun and military uniforms belong to her fiancée who claimed to be a soldier. The said Sampson David who has been terrorizing Owerri and its environs of kidnapping /robbery was arrested and what is more he confessed to the crimes of unlawful possession/impersonation in that he stole the gun from the Nigeria Legion office in Abia. most Armed Robbery/kidnapping within Ideato South/North and Orlu LGA of Imo State. On interrogation, suspects confessed to the crime. (2) SAMUEL OGWU ‘M’ 28 years old. A case of armed robbery was reported on information that suspected armed robbers were trying to register stolen vehicle. SARS operatives swung into action and arrested the above suspects and recovered the stolen car. The victim has identified his car in that he was robbed in 2017 at Bayelsa State.